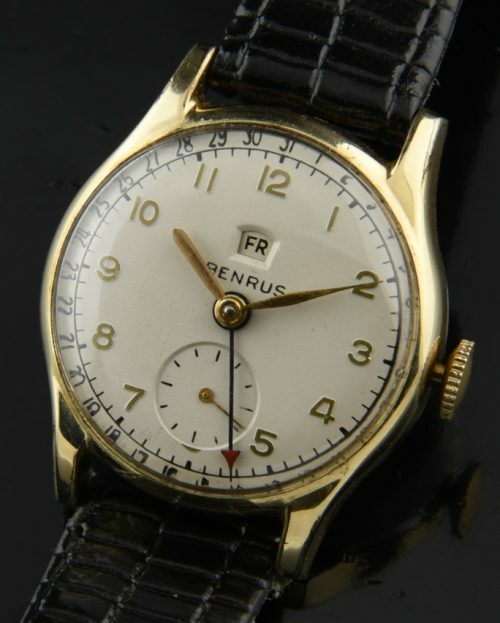 This was Benrus’s most complicated watch, manufactured in a small 30mm. rolled gold case and a manual-wind, 17-jewel Benrus Calibre CE-13 movement. This collectable vintage watch was just cleaned and is accurate. The unique feature is the day located in the top position and the pointer dated blued steel red-tipped hand. The gold filled case with steel back looks great. The dial was expertly restored and retains the original handset and raised gold toned Arabic numerals.